There are many reasons, but usually the number one reason is energy conservation. The following is a partial list of more reasons to insulate. At Border Insulators, we use a variety of insulating materials in sizes ranging from 1" - 20". This is the most common type used. It is made of inorganic mineral fiber and is used on all types of piping and vessels and is a non-combustible product with a melting point of approximately 2150° F. (1177° C), giving it excellent fire resistant properties. Mineral wool is a water repellent yet vapor permeable material. Calcium Silicate is a granular insulation made of lime and silica, reinforced with organic and inorganic fibers molded into rigid forms. This product is used for insulation up to 1200° F (650° C). It is a high temperature pipe and block insulation with superior durability, resistant to fungi and is non - combustible. Fiberglass Insulation is made from rotary glass fibers bonded with a thermo-setting resin. It is suitable for installation over hot, cold, concealed and exposed piping systems with operating temperatures up to 1200° F (650° C). We use a variety of different products ranging from aluminium jacketing with waterproofing membrane and canvas/fire protection, and PVC jacketing. Foam Glass insulation is what we use in all of our refrigeration projects. 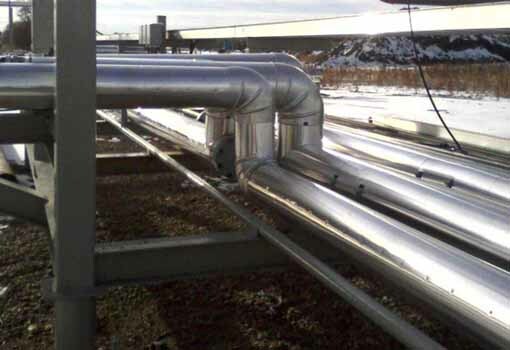 The Foam Glass insulation keeps the moisture off of pipe to prevent corrosion. © 2019 Border Insulators Inc. | All rights reserved.